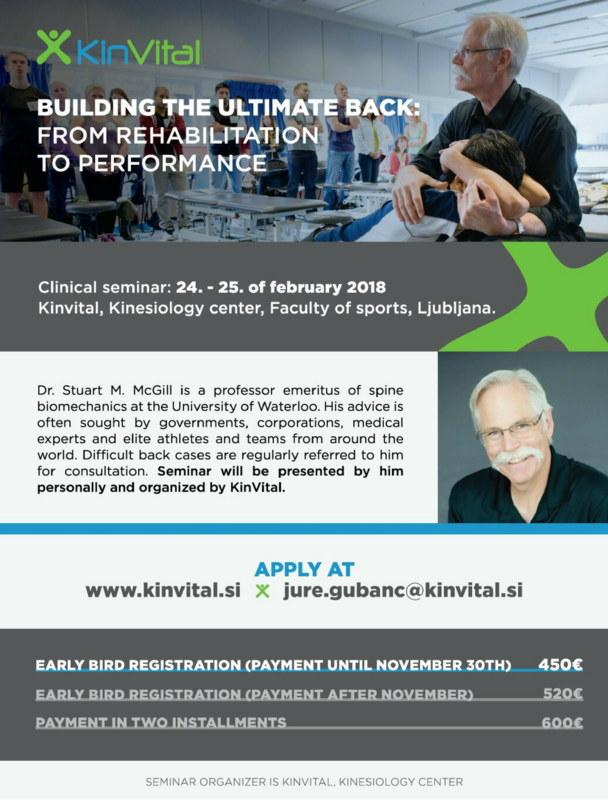 KinVital, kinesiology center is hosting one of the biggest names in the area of spine biomechanics, Stuart McGill, on 24th to 25th of February 2018 in Ljubljana, Slovenia. Upcoming two day course combines lecture and hands-on skills development workshops to introduce the McGill Method of enhancing patient outcome and is intended for clinicians, trainers, students of therapy and professionals in other areas of kinesiology and movement practices. For payment information please contact jure.gubanc@kinvital.si. • To update delegates on the most recent developments in function of the lumbar spine – specifically how it works and how it becomes injured, and how this is linked to pain sensitivity. This is to develop an evidence based foundation for clinical decision making. • To provide guidance in the application of this knowledge to the clinic, workplace, rehabilitation centre, and sports field to reduce the risk of injury, optimize healing of the patient, and build ultimate back performance in the athlete. • To give practice and technique development with workshops throughout both days. *Course will be presented in English. • Building the foundation: Dispel the myths about how the spine works and becomes injured. Anatomical, biomechanical and motor control perspectives are provided to setup the clinical approaches. • Interpreting patient presentation: Understand aberrant motion and motor patterns and possibilities for corrective exercise. Provocative tests and their mechanical basis provide guidance for optimal exercise design. Lecture and workshop. • Preventing Back Disorders: No clinician can be successful without removing the cause of back troubles in patients. This section teaches delegates how to identify the causes and how to remove them. Lecture and workshop. • Rehabilitation Exercise: Biomechanics and Clinical Practices – Many exercises prescribed to low back patients have not been subjected to scientific examination. This component of the course attempts to quantify and rank exercises for their spine loading, muscle usage and stabilizing potential. Algorithms for choosing the best exercise approach for each individual are provided. Technique is then honed to make exercise tolerable and effective. Lecture and workshop. • Training for performance – Training the back for performance (either athletic or occupational) requires different approaches and objectives than training to fulfil rehabilitation objectives. Some of the techniques developed in our work with world class athletes will be introduced and discussed within the context of valid mechanisms and evidence. These include the progressions from establishing motor control patterns, through to stability, endurance, strength, power and agility. Formalization of some of the performance “tricks” including how to get through “sticking points”, and developing “superstiffness” will be done in lecture and practical sessions. Dr McGill has authored three textbooks: “Low Back Disorders: Evidence based prevention and rehabilitation”, Third Edition, published by Human Kinetics publishers, (www.humankinetics.com), 2016, and “Ultimate back fitness and performance”, Sixth Edition, published by Backfitpro Inc (www.backfitpro.com), 2017, and Back Mechanic, 2015. Back Mechanic was also translated into Slovenian language and is coming soon in autumn 2017. These books synthesize the material presented in this course and are recommended as resource material for interested delegates. Course organisers reserve the right to make alterations to fees, arrangements and dates for teaching and learning sessions, including the decision to run all or parts of the course in the light of demand. In the event that the course is cancelled or re-scheduled by the course organiser, a full refund of fees will be given, but organizer takes no responsibility for travel or accommodation expenses incurred by the delegate. If for any reason you are unable to attend the seminar please be aware that fees will be refunded, less a €10 administration charge, for all cancellations received at least 30 days before the event. Cancellations received after the 30 day period but 7 days prior to the seminar date will receive a 50% refund less the €10 administration charge. No refunds can be given after this time. Contractual disclaimer: KinVital acts in good faith with respect to the contents of this course information and advertisement material. KinVital does not accept liability resulting in refunds for the content and delivery of the event itself, which remains at the sole discretion of the course speakers and contributors.